Savvy players in the global tuberculosis testing market are banking upon strategic acquisitions to grow their shares. They are also pouring money into product development. Such actions of companies are benefitting the market, along with the rising instances of tuberculosis. Currently, hospital laboratories generate maximum demand in the global tuberculosis testing market. The growth in the hospital laboratories can be attributed to the cost effective tests available in hospital laboratories. The physician's office laboratories segment is another key end-use segment which is proliferating worldwide because of their cost effectiveness. According to a Transparency Market Research report, the global tuberculosis testing market will likely expand at a tepid CAGR of 3.9% from 2017 to 2025 to become worth US$3.18 bn by 2025. Depending upon type, the global tuberculosis testing market has been divided into chest x-ray, culture based tests, IGRA (interferon-gamma release assays), mantoux test (TST), nucleic acid testing (NAT), Xpert test, serological tests, smear microscopy and other tests such as ADA, etc. Of them, the culture based tests held a leading share in 2016. In the years ahead too, the segment is expected to retain its dominant share vis-à-vis revenue. This is because it helps to diagnose and confirm active tuberculosis more accurately. Culture test is one of the major confirmatory test for TB diagnosis that utilize sputum or other clinical specimens. A culture test is often carried out to confirm the absence of MTB, boosting the market. In terms of growth rate, the IGRA (Interferon-Gamma Release Assays) segment is expected to surpass all others in the forecast period. The two commercially available IGRAs, namely QuantiFERON-TB (QFT) and T-SPOT.TB have been CE-marked for use in Europe, increasing its availability and acceptance. This is projected to fuel the IGRA segment during the forecast period. From a geographical standpoint, Asia Pacific dominates both in terms of revenue generation and growth rate. By clocking a CAGR of 4.9% from 2017 to 2025, the region is expected to grow its revenue to US$1.11 bn. The market in the region has enormously benefitted from the increasing approvals of tuberculosis tests, government grants towards research on tuberculosis such as research and other government initiatives such as tax credit and fee waivers. Europe trails Asia Pacific in terms of revenue generation because of the rising prevalence of tuberculosis in the region. By rising at a CAGR of 3.5% from 2017 to 2025, the region is predicted to clock in a revenue US$708.3 by 2025. Presence of numerous big names in the region who are constantly developing new products has provided a major boost to the market. The Middle East and Africa is another key region that is expected to grow at a relatively faster pace because of the increasing instances of tuberculosis, the increasing government focus on establishing regulations for the approval of tuberculosis tests, and growing focus on awareness programs by the tuberculosis diagnosis testing kits manufacturing companies, among others. In North America powered by the U.S. is one of the major market for global tuberculosis testing market. Some of the prominent players in the global tuberculosis testing market are Becton, F. Hoffmann-La Roche Ltd., Thermo Fisher Scientific Inc., Hain Lifescience GmbH, Hologic Inc., Abbott Laboratories, Alere Inc., Epistem plc, Cepheid, bioMérieux SA, Akonni Biosystems Inc., LIONEX Diagnostics & Therapeutics GmbH., Danaher Corporation, Creative Diagnostics, QIAGEN, and Oxford Immunotec Ltd. Tuberculosis testing can be defined as the most commonly used diagnostic tools for the tuberculosis. Tuberculosis is defined as an infectious disease which characterized by development of tubercles (nodules) in the body tissues, especially in the lungs. The market is anticipated to grow at a significant rate owing to various factors such as high return on investments, first-mover advantage to the tuberculosis test kits manufacturers, growing focus on awareness programs by the governmental and non-governmental organizations, and tax credits and fee waivers offered by the government, among others. The research is a combination of primary and secondary research, conducted for understanding and arriving at trends, used to forecast the expected revenue of tests employed in the diagnosis of tuberculosis in the near future. Primary research formed the bulk of our research efforts with information collected from in-depth interviews and discussions with a number of key industry experts and opinion leaders. Secondary research involved study of company websites, annual reports, press releases, investor presentations, analyst presentation and various international and national databases. The report provides estimated market size in terms of US$ Mn for test type, end-user, and geography for the period 2015 to 2025, considering the macro and micro environmental factors. The revenue generated from each test type, and end-user was calculated by considering the prevalence of tuberculosis, testing approvals, regulatory procedures, and the awareness of tuberculosis across all the geographies. The market report comprises an elaborated executive summary, which includes market snapshot that provides information about various segments of the market. It also provides information and data analysis of the market with respect to market segments based on test type, end-user, and geography. The market overview section of the report analyzes market dynamics such as drivers, restraints and opportunities that influences the tuberculosis testing market in the current and future scenario. The report also provides Porter’s five forces analysis, the acquisitions timeline of tuberculosis testing companies, SWOT analysis of the market, regulatory scenario, comparative analysis of tuberculosis testing policies, tuberculosis prevalence globally, pricing scenario of the tuberculosis testing, and major used tuberculosis tests. Market share analysis among the market players is analyzed to signify the contribution of these players in the market in terms of percentage share. All these factors will help the market players to decide about the business strategies and plans to strengthen their positions in the global market. Based on geography, the market has been analyzed for major regions: North America, Europe, Asia Pacific, Latin America, and Middle East & Africa. The study also covers detailed country analysis contributing majorly in the tuberculosis testing market. The report also profiles the major players in the market and provides various attributes such as company overview, financial overview, product portfolio, business strategies, and recent developments. 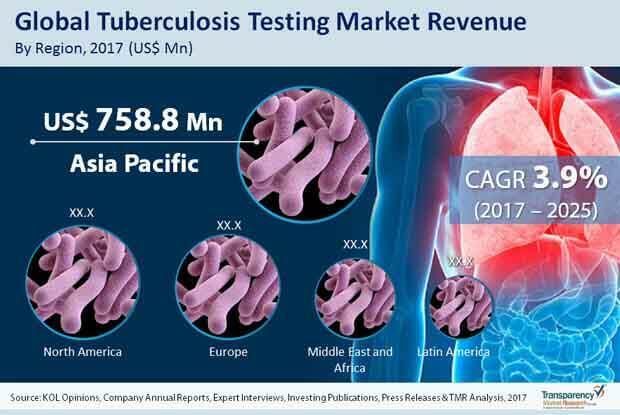 Companies profiled in the tuberculosis testing market report are Becton, F. Hoffmann-La Roche Ltd., Thermo Fisher Scientific Inc., Hain Lifescience GmbH, Hologic Inc., Abbott Laboratories, Alere Inc., Epistem plc, Cepheid, bioMérieux SA, Akonni Biosystems Inc., LIONEX Diagnostics & Therapeutics GmbH., Danaher Corporation, Creative Diagnostics, QIAGEN, and Oxford Immunotec Ltd. among others.